Microsoft reported first-quarter calendar earnings that beat estimates, although profits and revenue both declined. The company said that its customers have begun embracing its cloud offerings, especially Office 365. Microsoft reported net income of $5.66 billion for the March quarter, down about 7 percent compared to the net income of $6.1 billion Microsoft reported a year ago. Microsoft also reported $20.40 billion in revenue, a 0.4 percent decrease compared to the $20.49 billion it reported for the first calendar quarter of 2013. Analysts polled by Yahoo Finance expected Microsoft to report earnings of 63 cents per share (versus the 68 cents per share the company reported) on revenue of $20.39 billion. 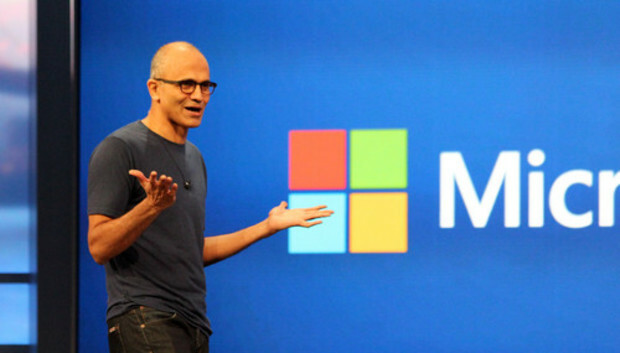 Microsoft's revenue continued to be driven by its enterprise businesses. Its Commercial businesses, combining its Commercial Licensing and Other units, reported revenue of $12.23 billion. But Microsoft's three Consumer business units demonstrated the sharpest growth, up 12 percent to a total revenue of $8.30 billion. "This quarter's results demonstrate the strength of our business, as well as the opportunities we see in a mobile-first, cloud-first world," said Satya Nadella, chief executive officer at Microsoft, in a statement. "We are making good progress in our consumer services like Bing and Office 365 Home, and our commercial customers continue to embrace our cloud solutions. Both position us well for long-term growth. We are focused on executing rapidly and delivering bold, innovative products that people love to use." Microsoft called out Office 365 as a particular driver. On the consumer side, Office 365 Home added 1 million subscribers in three months, to a total of 4.4 million. And commercial seats of Office 365 about doubled, as did revenue. Windows OEM revenue grew 4%, driven by strong 19% growth in Windows OEM Pro revenue, the company said. Microsoft's Surface revenue also grew over 50 percent to about $500 million, and the company sold 1.2 million Xbox One consoles, including an additional 800,000 Xbox 360s. Even Bing grew its search share, to 18.6 percent, and search ad revenue grew by 38 percent. All three consumer units reported revenue increases: Devices and Consumer Licensing was roughly flat, with a $30 million increase to $4.38 billion. Devices and Consumer Hardware reported a 40.7 increase to $1.97 billion, and Devices and Consumer Other--which includes Xbox Live revenue and Bing--saw a 17.8 percent increase to $1.95 billion. Microsoft's Commercial Licensing also reported a 3.45 increase in revenue to $10.3 billion, while the Commercial Other division demonstrated a 31 percent increase to $1.9 billion. But Microsoft's revenue decline came from its corporate business unit, which reported a payout of $127 million, versus revenue of $1.65 billion from a quarter ago. Microsoft has scheduled a conference call with Wall Street analysts at 2:30 PM this afternoon, when new chief executive Satya Nadella is expected to speak. Historically, former chief executive Steve Ballmer passed along those responsibilities to other executives. However, Nadella has been the face of the company since his appointment as Microsoft's new chief executive, appearing at events ranging from the launch of Office for iPad to the launch of the latest version of SQL Server. On Friday, Microsoft said that it would complete the acquisition of Nokia, adding approximately 32,000 employees to its ranks. Critics took a negative view of the deal, although Nokia could interject some needed verve into the Microsoft fold. And that's before Microsoft released Windows Phone 8.1, a substantial, significant update for the operating system.